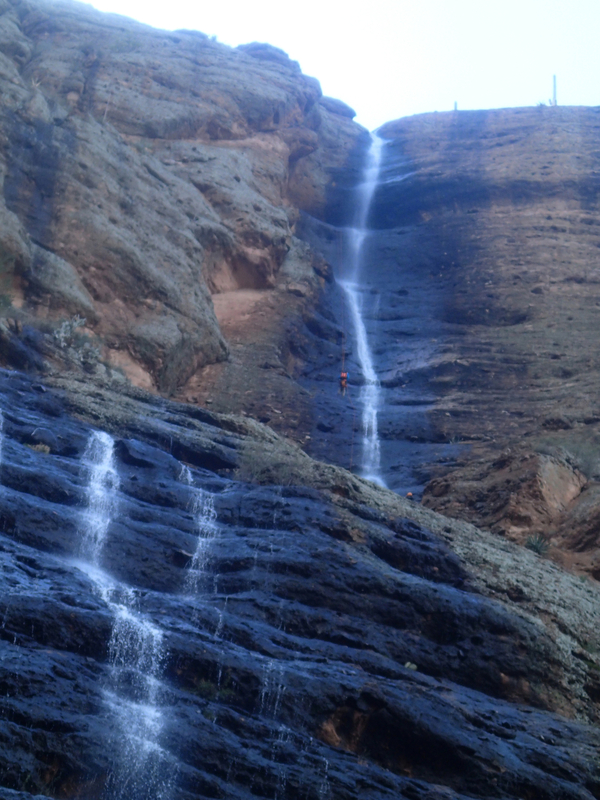 Zigzag canyon is a fun section in the Superstitions to run when recent rains have created a good flow. In my opinion this is more of a sport rappel than a traditional canyon, but it is just as fun when your looking for something close to phoenix. Zigzag is a 550' wall, that zigs and zags in the middle section and finally drops you down to the Apache Trail just up the road from the Fish Creek bridge. On the several trips I have run, we typically negotiate it in sections carrying (3) 200' ropes (1) simply for good measure should one of our primary ropes have an issue. Learning that several groups have had issues with stuck ropes on the first rappel with at least one ending in rescue (and being very confused as to why), we made a good effort during our most recent run to evaluate the rigging. It appears a pair of well seated, but very poorly placed bolts may be the primary culprit. As you approach the first drop and begin to examine rigging options, one will find a pair of 2 very obvious bolts that cannot be missed. While these 2 bolts provide easy rigging, and a comfortable starting point, they were placed directly in the watercourse and set back an unreasonable distance from the edge to provide an ideal pull. Rigging here can easily set you up for failure. 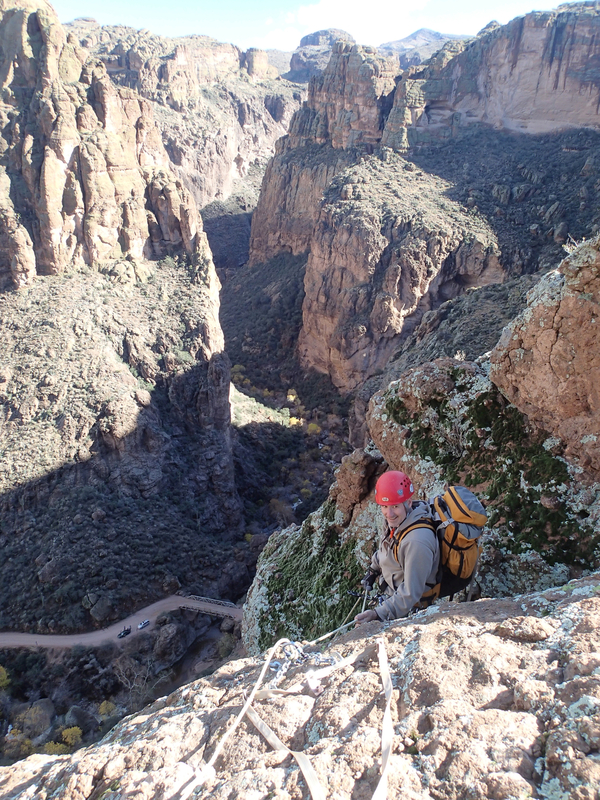 Climbing out of the watercourse/chute and immediately canyon right up the rock will quickly reveal the traditional well placed bolts sitting on the drops edge that set us up for a successful first rappel/pull. The wall is traditionally broken up into 4 drops, the first is about 90' into a small alcove that makes for a convenient place for someone with rope to go down and rig the next ≈ 190' drop with the rest of the crew still above. With the second drop rigged, we can easily sequence the rest of the group through this alcove and on to the next rope to avoid overcrowding. Dependent on group size, this is a fairly large alcove and will hold your typical group (6-8) size if necessary. Lots of loose rock here should indicate some caution, and its always best to be clipped in. The landing zone below is large and will comfortably hold all members of your crew. Making your way canyon right past a set of climbers bolts, you will find the next canyoneering anchor. This drop is roughly 70’ from the pair of bolts and will drop you down to a nice flat section where the final drop measuring roughly 170’ can be rigged. 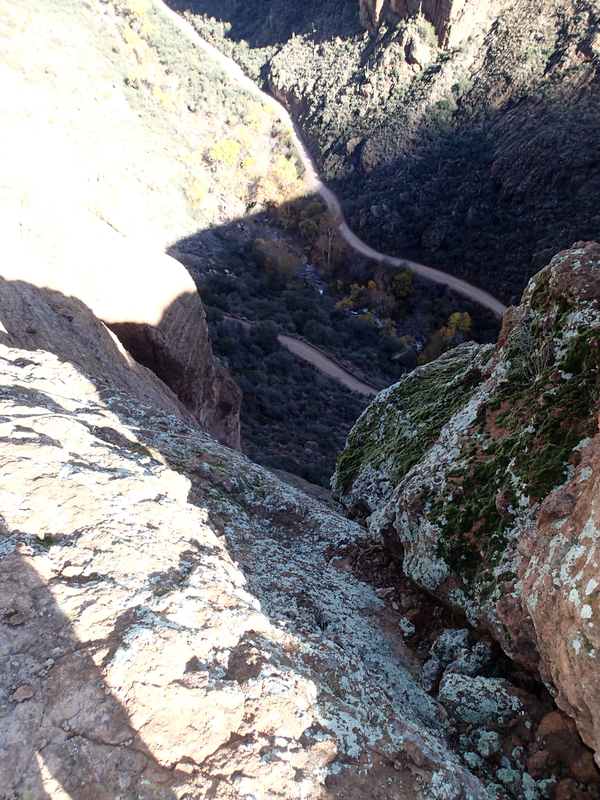 Once down this final drop, simply make your way to the car you have been staring at since the first rappel and say hello to the tourists who gathered near the bridge to take photos.